Filled with rustic decor and tribal art, this two bedroom plus loft has both character and convenience. Your family or group up to nine will have plenty of space to socialize and move about. The fully-equipped kitchen features new appliances, and the living room is set up with a new flat screen TV (no cable). The master suite is furnished with one queen bed, while the loft and second upstairs bedroom offer a combined four twin beds. The living room sleeps an additional three guests on one queen sofa bed and one small twin futon. 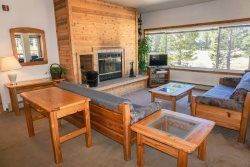 Did we mention this condo is steps from the main lifts? Leave your car in the underground parking lot because you won't need it your entire trip! Walk to restaurants and the general store with ease!